I've started the process of trying to make compost using a compost tumbler from World's Best Organic Compost Tumblers. I put the tumbler together over a month ago, but couldn't start making compost right away. The instructions said it would work best if it was filled up all at once with 50 percent brown plant material and 50 percent green plant material. But there is no green plant material in a zone 5 garden in early March, so my original plan for the tumbler was to get out the grass catcher for the lawnmower and bag the grass clippings the first time I mowed the lawn in late March/early April. But that would have involved finding the grass catcher (I think it is in the attic), figuring out how to attach it (since I've never used it before) and then mowing with it attached (and having to stop periodically to empty the bag, thus distrupting the "zen" experience of mowing the lawn). 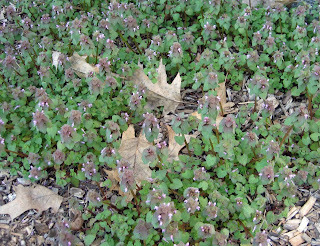 Then I saw henbit growing in the paths of my raised vegetable garden, lots of green, fresh henbit. So I changed my mind about using grass clippings as the green material for the compost tumbler and went with the henbit. I had plenty of it, more than enough to add with some brown plant material (which I took off the top of my compost bins) and fill up the compost tumbler. Then I put the lid on and tumbled it around a few times. So far so good. It remained steady on its base and didn't require a lot of effort on my part to spin it. Let the composting begin. 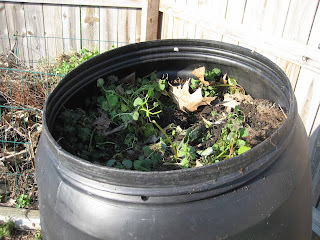 I'll "tumble" this barrel every day or so and well see how long it is until I have compost. And because I had a lot of henbit, we can also see long it is before the henbit I threw on the traditional compost bins disappears and turns into compost, too. There is, by the way, one minor thing about this tumbler that I don't like. It is black. It sticks out in the garden and is big enough that there is no good place to hide it, at least in my garden. But I got an idea when I visited a garden in Austin, Texas on Saturday where the owner had a plastic barrel of comparable size. She had painted hers to blend in more with the garden. I might try this on this tumbler and spray paint it tan or green to make it blend in more. I'll use a paint that is supposed to stick to plastic. It will either improve the looks of the tumbler or make it worse. I'll only find out by trying! Even spray painting's not going to help in my space. Too formal. I might be able to hide it. Luckily I still have all my hyacinth and paperwhite foliage--that should provide enough green. Hoping to catch up with you. Maybe I can cheat in some way! Henbit? That's what that is. We have that here in Seattle. Annoying. I also need another compost bin but they're so darn expensive! I wonder if painting the composter will slow down the composting process. With it being black, I would think that would increase the heat, which helps compost the materials inside. I wonder if putting up a movable picket fence would work. I need to get of my duff and make a compost bin for my garden. I will be anxious to hear if your bin works. I would like a faster method than just stacking in a pile as I do now for compost. It works just fine but I guess I am sounding like the now generation. I want my compost now not 6 months from now. I'll point out that the black has a purpose. The hotter it gets, the faster it works, and black absorbs the most heat from the sun. 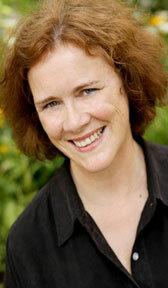 A white tumbler, or any other color other than black, will of course not work as quickly. Of course, if you're sticking this one in the shade, you're not getting any sun anyways, in which case the color won't matter. Don't forget to add some finished compost as a seed to get the colony going since it is new, and make sure it is adequately moist. Chris, I did think about the heat factor. I'm going to leave the compost tumbler "as is" for this first batch and see how long it takes. It is in the sun. Then I might paint it and try another batch to see if it makes a big difference. I also added some compost as "seed" to get things started. Your directions were very good! Thanks everyone else for the comments, and stay tuned for updates on my "tumbled compost". If you spray paint the barrel green, let dry, and then use some leafy branch clippings as masks and spray on a darker green in random swaths, you can create a very nice camo effect that will help blend your barral in. Try it on a big piece of cardboard first. Use Krylon or similar paint for plastics. Just a thought for next time you don't have any green stuff: find a greengrocer. They usually have boxes full of the outer leaves of cabbages, spoilt salad greens, etc. I found this post when I was looking for tips about what color I should paint the composter that my husband and I built this weekend. We used plans found here: http://www.montgomerycountymd.gov/content/dep/greenman/pallets.pdf to build a composter made out of wooden pallets that we got for free from a local printing company. I just wanted to suggest this for anyone wanting to build an inexpensive composter or to add a second composter. We varied just a bit from the instructions and spent a little money on hardware to connect the pallets to give it a more finished look.